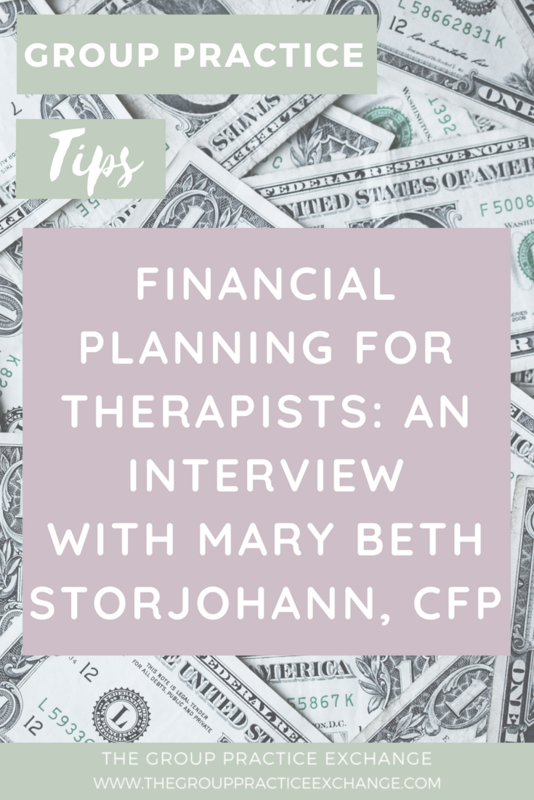 In today’s blog post, I ask my financial planner, Mary Beth Storjohann, CFP, some of the biggest questions therapists have about financial planning. Mary Beth is a guru in this field, who’s regularly interviewed and featured in businesses like The Wall Street Journal, NBC, Forbes, and Business Insider. 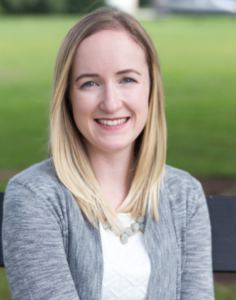 Her business, Workable Wealth, specializes in working with the Gen Y population (those in their 20s-40s) by helping them make smart choices with their money. Maureen (M): What’s the difference between a financial planner and an accountant? Mary Beth (MB): A financial planner, or financial advisor, will help you look at the entire picture of your financial life. A planner will help you figure out how to accomplish your financial dreams by establishing clearly defined goals, evaluating your current money situation, identifying strengths and weaknesses, and creating a plan and steps to help you get there. Your accountant is a great resource, even if you consider yourself good with numbers. An accountant can help you prepare your taxes, offer appropriate tax shelter recommendations, manage depreciation schedules, and more. M: How can a financial planner help us? MB: Even if you like to manage your own money, it’s helpful to have a trained eye to look for opportunities and risks you might not see yourself. Sometimes the most valuable thing a financial planner can do for you is to prevent you from making emotional decisions. An advisor can help you with money management, investing advice, estate planning, insurance planning, business planning, and more. Essentially I help pull together the big picture of your financial life, coach you through what’s working, what’s not and changes to make and help to create and implement an action plan to get you to a place of feeling secure and confident in your financial situation. M: What’s the number one mistake people make with regards to their business? MB: The number one mistake people make with regards to their business finances (therapists as well), is not paying attention to the numbers. There’s a constant stress around not earning or netting enough, but upon digging in I usually find that income and expenses aren’t being tracked as closely as they could be, expenses aren’t being adjusted in order to “net” more income and taxes aren’t being appropriately accounted for so there’s often a feeling of catching up each quarter or year end for business owners. M: What is one recommendation you would give to group practice owners with regards to financial planning? MB: It’s hard to start with just one. I think it’s important to get clear on what is “enough” for you in terms of your earnings. How much do you need to make on a “net” basis (after expenses) in order to support your personal lifestyle needs as well as save for your retirement. There’s often a lack of clarity around what one should be saving and how much needs to be saved in order to meet goals. Figuring out how much money will support you, how much you need to meet other financial goals (expanding the business, new hires, etc.) plus personal financial goals (retirement, college funding, home purchases, etc.) is the first step in putting a plan in place. In short, be specific about what you want and need. M: There are various answers to how much we should have saved in our business accounts, from one month’s worth of income to six months worth of income. What’s your opinion? How much money should someone have saved in their counseling business? That’s a big number to tackle so my recommendation is to start with the first $1,000 in place and then to work up from there. Having a cash reserve in place in case of lean months will give you the flexibility and comfort you need instead of feeling stressed and stretched too thin. M: What advice would you give to a group practice owner who is trying to figure out how to pay themselves? I know this question is out there; Do I take 100% of my own income? How much of the passive income of my group should I take? How do I know when I am ready to start taking more income (especially passive income from what my clinicians make) from my business? MB: This is that hard part about personal finances (and business finances when they overlap). What you pay yourself is going to be specific to your situation. Simply because the overhead you have to keep your practice running may vary significantly from the overhead someone else has in a different state to keep their practice open. First, you need to ensure you’re covering the expenses. Then you need to ensure you’re setting aside enough for taxes. THEN you figure out what you can afford to pay yourself. My recommendation is to start with a conservative, lower number if possible while you’re testing things out. Ensure that you’ve also factored in any business goals that may require a capital commitment or additional money set aside. Assuming things are on track, bump up your income every 6 months in increments of a few hundred dollars (or more) a month if possible. It’s not necessarily a percentage game as much as it is an understanding your overhead expenses and what amount of money you need to run it and grow it game. Anything left over after that and taxes is typically fair game! M: On the personal side, what is one way we can better have control of our personal finances? 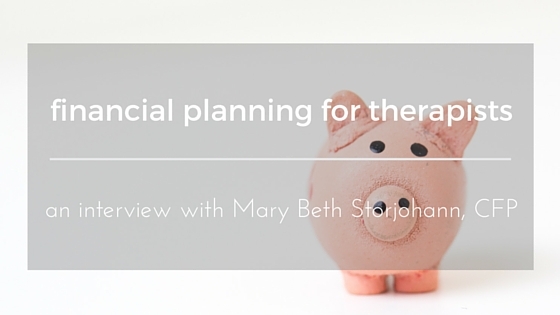 MB: If you had to do ONE thing to have better control of your finances, the most simple and effective strategy I know of is having separate savings accounts for separate goals. If you want to buy a new car, travel each year, remodel your house and save for retirement, each of those goals should have a separate account opened with separate dollar amounts attached as the end goal and you should make monthly contributions to reach each goal. M: Let’s talk about the future. I know we all could probably be saving more for retirement. Is there an algorithm for how much of our total income we should be putting into our retirement accounts? If not, what’s one thing we can do today to save more toward retirement? MB: Unfortunately there’s no a one-size-fits-all answer to the question of how much you should be saving. How much you personally need to save depends on your goals, what you’d like to accomplish, and what your ideal future looks like. Envisioning your ideal lifestyle after work (and when you’ll need to start drawing from your investments) will help to make some educated guesses on your expenses. You can then create a mock yearly budget for yourself. Multiplying that budget over a period of years (like 25, 30, or 40) will give you an idea of the total amount you’ll need in your nest egg before you can retire – and you can work backward from there to determine how much you need to invest each month during your working career to meet that goal. A good rule of thumb is the 4% Rule: The 4% Rule helps show you how much you can withdraw annually in retirement. Let’s say you retire with $1,000,000 in your portfolio. The 4% rule says that, in order to stay solvent throughout your retirement years, you should withdraw no more than 4% of that $1,000,000 – or $40,000 a year. Every year thereafter, you will continue to withdraw $40,000 adjusted for inflation and returns. *Need a good EHR for your group practice? 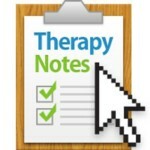 TherapyNotes is it. 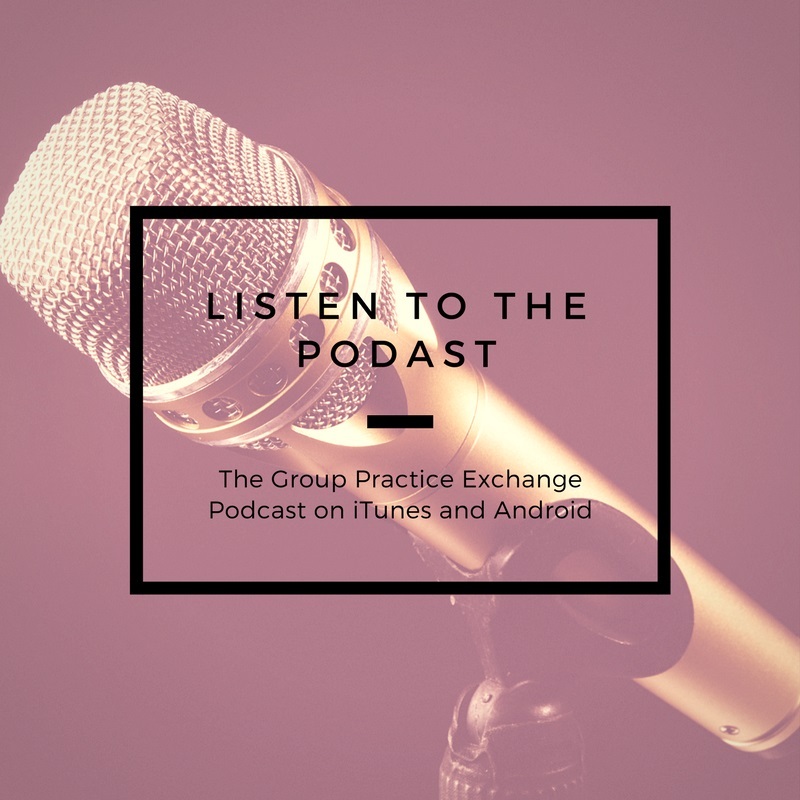 I’ve been using it for years in my own group practice, and it does really well when it comes to having the features group practice owners need. Try it out for FREE for 2 months by clicking here. I am glad you mentioned how financial planning can help. I am sure that I will want to have someone that is willing to work as my fiduciary. I am going to make sure I keep these things in mind for the future, for when I need help finding a financial planning.